The United States Department of Transportation’s (USDOT’s) Accessible Transportation Technologies Research Initiative (ATTRI) is a joint USDOT initiative, co-led by the Federal Highway Administration (FHWA), Federal Transit Administration (FTA), and Intelligent Transportation Systems Joint Program Office (ITS JPO), with support from the National Institute on Disability, Independent Living, and Rehabilitation Research (NIDILRR), and other Federal partners. The ATTRI Program is leading efforts to develop and implement transformative applications to improve mobility options for all travelers, particularly those with disabilities. USDOT has awarded six applications development funding for Wayfinding and Navigation, Pre-trip Concierge & Virtualization, and Safe Intersection Crossing, with NIDILLR awarding a grant in the Robotics and Automation technology area. Working together, the four technology areas will provide the basis for an accessible transportation network that is far more economical, expansive, and welcoming not only to travelers with disabilities, but to all travelers in the United States. The accessibility of a transportation system can be described in terms of the ability of individuals to go from home to a destination without breaks, or in terms of a travel chain with various links such as trip planning, travel to station, station/stop use, boarding vehicles, using vehicles, leaving vehicles, using the stop or transferring, and travel to destination after leaving the station or stop. If one link is not accessible, then access to a subsequent link is unattainable and the trip cannot be completed. Thus, the travel chain defines the scope of potential research and development in accessible transportation. The ATTRI team has recently deployed technology from the Smart Wayfinding and Navigation (SWaN) project at FHWA’s Turner-Fairbank Highway Research Center (TFHRC). Wayfinding allows users to move from place to place, and it requires that users understand their spatial location, select routes that will meet their needs (shortest path, navigation via stairs or elevator), and verify their route progress in real-time as they proceed along the route. Wayfinding also ensures that users know when they reach their destination. The SWaN project aims to develop and deliver a mobile location and routing service that provides travelers with real-time location, en route assistance, and situational awareness so that travelers can safely navigate indoors and outdoors while traveling independently. SWaN will support path planning and routing and will support applications that can deliver wayfinding for travelers with diverse needs. SWaN will operate on standard smartphones and smartphones paired with a wearable accessory. SWaN’s core innovation is a navigation and wayfinding mobile service with open application program interfaces (APIs) that deliver localization, orientation, waypoint navigation, and route guidance. The APIs will enable independent travel for individuals with vision, mobility, hearing, and cognitive disabilities. Ubiquitous location and navigation capabilities in any venue, including complex transportation hubs with many levels, both above and below ground. Precise navigation exactly where it is needed (e.g., stairwells and elevators or junction points where path decisions must be made) while supporting infrastructure-free areas where a location does not need to be precise (e.g., wide hallways). Routing that supports the independent travel requirements of users with disabilities, allowing applications to request routes based on specific user priorities. There are many layers of location assistance found at TFHRC. 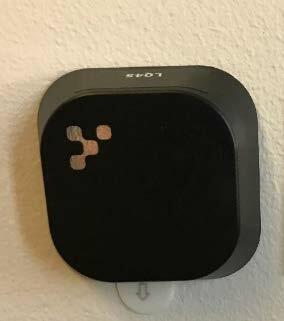 Some areas are mapped (where features such as stairwells, elevators, and WiFi signals are used to improve location), and other areas are outfitted with Bluetooth low energy beacons in addition to the mapping. 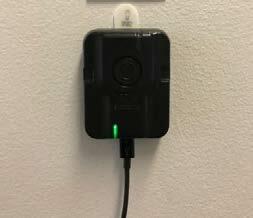 A Bluetooth low energy beacon at TFHRC. There are also areas at TFHRC equipped with ultra-wideband beacons that supplement the mapping. An ultra-wideband beacon at TFHRC. Each layer of location assistance improves the detected location of the user, increases capabilities for certain user populations, and supports a wider array of application developer use cases. In the first year of the two-year SWaN project, the ATTRI and its partner, TRX Systems, will focus on the technical development of the localization and accessible routing capabilities. In the second year, the team will focus on integrating the technology with accessible application developers to advance the underlying location and routing technology and to expand the availability of applications delivering accessible navigation support. For more information, contact Mohammed Yousuf, 202–493–3199, Mohammed.Yousuf@dot.gov. The FHWA’s Research and Technology (R&T) Evaluation Program seeks to assess and communicate the benefits of the FHWA Research and Technology program to ensure it is expending public resources efficiently and effectively. FHWA conducts research and technology development to meet the transportation challenges of today and tomorrow. FHWA partners with State transportation departments, local agencies, industries, and academia to conduct research on issues of national significance and to accelerate adoption and deployment of promising research products. The R&T Agenda identifies six high-priority highway challenges: (1) advancing safety toward zero deaths, (2) improving the mobility of people and goods, (3) maintaining infrastructure integrity, (4) enhancing system performance, (5) promoting environmental sustainability, and (6) preparing for the future. The R&T Agenda is intended to catalyze collaboration and accelerate innovation. FHWA initiated its R&T Evaluation Program to increase transparency, better communicate research benefits, and continually improve R&T efforts in the service of the public good. For a more detailed look into the R&T Evaluation Program, download the newly published TechBrief, “FHWA Research and Technology Evaluation Program,” available at https://www.fhwa.dot.gov/publications/research/randt/evaluations/18034/index.cfm. For more information, contact John Moulden, 202–493–3470, john.moulden@dot.gov. Augmented Reality (AR) has a potential to reduce construction cost, improve delivery time, and assist with overall management of a construction project. AR is an immersive technology that combines virtual computer-generated information with the real environment in the real-time performance, which enhances the user’s perception of reality and enriches the provided information content. Such information can assist project managers and engineers with the safer delivery and accuracy of their construction projects and in a timelier manner, resulting in greater efficiency. In addition, with the capability of navigating through all phases of a construction project, project personnel can convey project intent and would be able to catch and act on any errors or mistakes before they present themselves in the field. On May 9, 2018, at TFHRC, FHWA will host an AR workshop. The workshop is part of a research study that investigates the availability, accessibility, and reliability of using AR for construction inspection and review, quality assurance, work zone review, training, and improved project management through real-time information in a real-world environment. The workshop will include participation from State transportation agencies, vendors and suppliers, academia, and contractors. The workshop will have three parts. Part One involves technology demonstration by vendors and suppliers. The goal is to help educate the rest of the audience, including those from transportation agencies, on the current capabilities of AR and related applications in Mixed Reality (MR). Part Two is a brainstorming session to identify transportation construction applications. Part Three identifies the impact of AR on project performance, the level of development required of the technology to make this application commercially available, and the level of training required of transportation agencies personnel if the application were available. The discussions at this workshop will help State transportation agencies, researchers, vendors, and contractors to better understand how AR technology can be used in a transportation construction project and will be documented as a part of the larger project. For more information, contact Katherine Petros, 202–493–3154, katherine.petros@dot.gov. FHWA recently awarded a new data collection contract for the Long-Term Pavement Performance (LTPP) program. This single contractor will collect pavement performance data at LTPP test sections throughout North America. In the past, the program has had four data collection contractors collecting the data, but with the reduction of the number of LTPP test sections being monitored, the program determined that a single data collection contractor was sufficient. As part of this new contract, transverse profile data will be collected using a new rut measurement system device installed on the profilers. For more information, contact Deborah Walker, 202–493–3068, deborah.walker@dot.gov. On May 10 and 11, 2018, FHWA will host a workshop on advanced ultrasonic techniques that are under investigation as a possible alternative to radiography for inspection of steel welds in bridge fabrication. The workshop, to be held at TFHRC, will include participation from State transportation agencies, Full Matrix Capture/Total Focusing Method (FMC/TFM) equipment manufacturers, academia, and contractors. Ultrasonic weld inspection technologies continue to advance, providing more efficient inspection options with improved flaw characterization information. The most recent technique to emerge is the Phased Array Ultrasonic Testing (PAUT) technique – FMC/TFM. This technology is an industrial spinoff of advanced imaging processing techniques used in radar, sonar, and medical imaging applications. The concept is similar to the relatively old Synthetic Aperture Focusing Technique (SAFT), but the multiple sensor location information required by SAFT is obtained by the multielement PAUT probe in lieu of multiple single sensor locations. The images provided by the FMC/TFM process result in improved weld flaw sizing and characterization. This improved flaw sizing and characterization has the potential to be used in new bridge construction to replace radiography in the American Welding Society (AWS) D1.5 bridge fabrication code by providing sufficiently detailed flaw images. The improved weld flaw information could also be used to evaluate existing bridge welds with known or suspected flaws to provide the accurate flaw information required to support fracture mechanics based on fitness-for-service calculations and decisions. For more information, contact Hoda Azari, 202–493–3064, hoda.azari@dot.gov. Performance and reliability of civil structures have always been of great importance for infrastructure stakeholders. Structures experience operational and environmental loads over their service life, which can result in gradual deterioration because of corrosion and fatigue, and can decrease the serviceability and safety of civil infrastructure over time. Extreme load events such as earthquakes, scour, and other natural or manmade hazards are possible sources of severe damage to critical infra-structures. Disasters, such as bridge collapses, may occur, causing economic and social ramifications and even casualties. Furthermore, as infrastructure ages, demand for higher traffic and heavier loads increase, and scarce funding and limited maintenance increase the uncertainty of infrastructure’s performance. Structural Health Monitoring (SHM) aims to develop automated systems for the continuous monitoring, inspection, and damage detection of structures with minimum labor involvement. This enables maintenance and repair actions to be implemented more efficiently, with a direct impact on the reduction of operating costs as well as an increase in public safety. Wireless sensor networks and energy harvesting research have gained interest because of their ability to reduce the costs associated with the installation and maintenance of SHM systems. Wireless sensors provide easier installation and efficient data management, which presents a solution for long-term SHM at a lower cost than traditional wired systems. FHWA’s Exploratory Advanced Research (EAR) program is supporting research to develop self-powered wireless sensors that can assess and monitor structural health and assess conditions of bridges. One project that focuses on SHM is “Ultra-Low Power Wireless Sensing System.” This project is being conducted at Michigan State University (MSU) in collaboration with Washington University in St. Louis and the University of Southern California. Under this study, novel self-powered sensor technology has been developed and can achieve ultra-low power dissipation. The ultra-low power computation and data logging technology are capable of autonomous, long-term monitoring of dynamic loading events. The sensing technology offers several features that are not available in other classical SHM methods, including: (1) low power requirements (less than 80 nW power consumption); (2) self-powered continuous sensing (no batteries required); (3) possibility of deployment in dense networks given the small size of the sensors and that they do not rely on batteries; (4) autonomous computation and nonvolatile storage of sensing variables; and (5) wireless communication. A series of sensors have been installed by the MSU research team on the Mackinac Bridge in Michigan as part of SHM of the bridge. For more information, contact David Kuehn, 202–493–3414, david.kuehn@dot.gov, or Fred Faridazar, 202–493–3076, fred.faridazar@dot.gov. 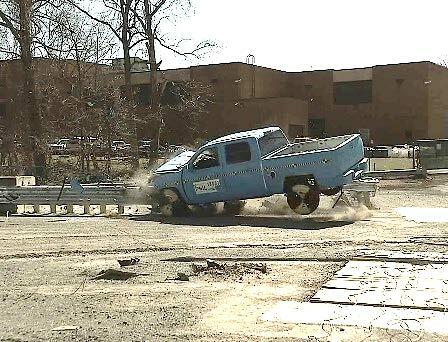 The FHWA Federal Outdoor Impact Laboratory (FOIL) conducted a full-scale crash test on March 5 at TFHRC in McLean, VA. The crash test is one in a series of proof-of-concept tests being conducted as part of a National Cooperative Highway Research Program study entitled, “Roadside Barrier Designs Near Bridge Ends with Restricted Rights of Way.” In this test,a pickup truck weighing 5,000 pounds traveling at 62 miles per hour impacted a short-radius bridge-end barrier head-on at an impact angle of 0 degrees. A pickup truck crashes into a bridge-end barrier at the FOIL crash test facility in McLean, VA. High-speed cameras, accelerometers, and speed-measuring devices captured the data in the crash event. The data will be used for further analyses and evaluations using computer simulations to develop a nonproprietary short radius barrier that meets the criteria for Test Level 3 impact conditions of the Manual for Assessing Safety Hardware. The objective of the research is to develop guidance on barrier safety treatment alternatives near bridge ends with restricted rights of way in a format suitable for potential adoption and inclusion as an update to the AASHTO Roadside Design Guide. For more information, contact Eduardo Arispe, 202–493–3291, eduardo.arispe@dot.gov. The Interactive Highway Safety Design Model (IHSDM) - HSM Predictive Method 2017 Public Release Update (version 13.1.0) is available for free downloading at www.ihsdm.org. The new version was released on March 16, 2018. Registered IHSDM users can visit www.ihsdm.org and use their IHSDM username and previously assigned password to access and download the new release. Users who have an earlier version of IHSDM installed will see a “call home” feature that will remind them to update to the latest version the next time they access the software. New IHSDM users can visit www.ihsdm.org and click the “Download Registration” link. Complete the form on the next page for complete access. The IHSDM is a suite of safety analysis tools used to evaluate the safety and operational effects of project-level geometric design decisions on highways. The IHSDM CPM serves as a faithful implementation of the HSM Predictive Methods (Part C) for two-lane rural highways, multilane rural highways, urban/suburban arterials, freeways, and ramps/interchanges.The complete IHSDM suite consists of six modules. For more information, contact the IHSDM Technical Support team, 202–366–0660, IHSDM.Support@dot.gov. This issue includes: Building Connections That Last; Refueling America; Ready for Takeoff; Smart Contracting; and Managing New Peaks at National Parks. It is available online via www.fhwa.dot.gov/publications/publicroads/18winter/index.cfm. For more information, contact Lisa Shuler, lisa.a.shuler@dot.gov. This issue includes: Safety First; Safety Awards Highlight Every Day Counts Innovations; Planning for Safer Local Roads; Agency Advance Policies to Enhance Safety for Walkers; Delaware Fair Displays Employee Ingenuity; Mainstreaming Innovation; and States Innovate. The issue is available online via https://www.fhwa.dot.gov/innovation/innovator/issue65/3dIssue/.